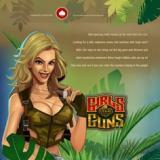 Relax gaming is a Malta based gaming software company that came into being in 2010. It is amongst the newest entrants in the casino software industry, and focuses on providing freemium and casual gaming experiences. Relax gaming boasts of an ability to offer high quality gaming applications and systems. The company has its offices in Malta and Tallinn, Estonia. They develop and maintain online gaming software for Bingo, Casino, and Poker sites. The development team at Relax gaming is flexible, motivated, and has a proven track record of offering fast turnaround. It is a small company, and most of its key employees are shareholders in the company, and carry rich experience in the gaming and casino industry. They are well versed with the nuances of trade, and understand exactly what the casino operators and players are looking for. Some popular gaming sites that use Relax gaming software include BingoHuone, PokeriHuone, Unibet Belgium, Batsafe.com, Maria, Unibet Poker, and Unibet casino and games. They have a number of highly innovative gaming applications to its credit. Which games are supported by Relax gaming software? Relax gaming has a portfolio of products that include Bingo, Poker, and casino platform. Relax gaming has taken Poker to a whole new level by developing their Fast Poker product, which is powered by a clean and fresh look, and supports the action packed fast fold poker format. However, they did not stop at this, and went a step ahead by introducing another more advanced Poker application. They call their latest Poker application BigGame poker, and as the name suggests, it is much more than the regular poker that you have been playing. The game play, environment, and the story line add much more punch to the game. It offers an experience that is a mix of casual gaming and real money gaming. Relax gaming bongo software offers everything that you would expect from a cutting edge, modern bingo application. It has different bingo rooms, chat application, both progressive and fixed jackpots, ability to stream video from live host, and integrated mini games. When the players buy bingo tickets, a portion of the amount is deducted to the house, and the rest is disbursed as prize money. The casino platform offered by Relax gaming is known as Silver bullet. It is a modern platform offering both proprietary titles, and third party games. They support both desktop and mobile casino games. What are the key features of Relax gaming applications? Relax gaming software is known for its innovativeness, and proving a twist to the old favourites such as poker, bingo, and casino games. The visuals, sounds, story line, and game play are extremely interesting. The games provide an experience that is a mix of real money gaming and casual gaming. Relax gaming software offers cutting edge gaming applications that offer a unique gaming experience, which is a mix of casual gaming and real money gaming. The software is certified safe and reliable.